During the initial swirling of the wine, I identified the aromas of lemon, minerals and perhaps green apple. The texture of the wine is very soft and smooth, due to it being aged in oak. The flavors of the wine are pretty complex and seemed to go through a few stages; lemon flavor, with a tart finish and a hint of sweetness. This cheese looked decadent, almost like it was whipped! As mentioned before, I have tried this triple cream and knew it was one I would enjoy. It did smell a little funky and tangy but it tasted soft, smooth, salty and a little chalky. It was very nice, not overpowering and a great texture that melts in your mouth. 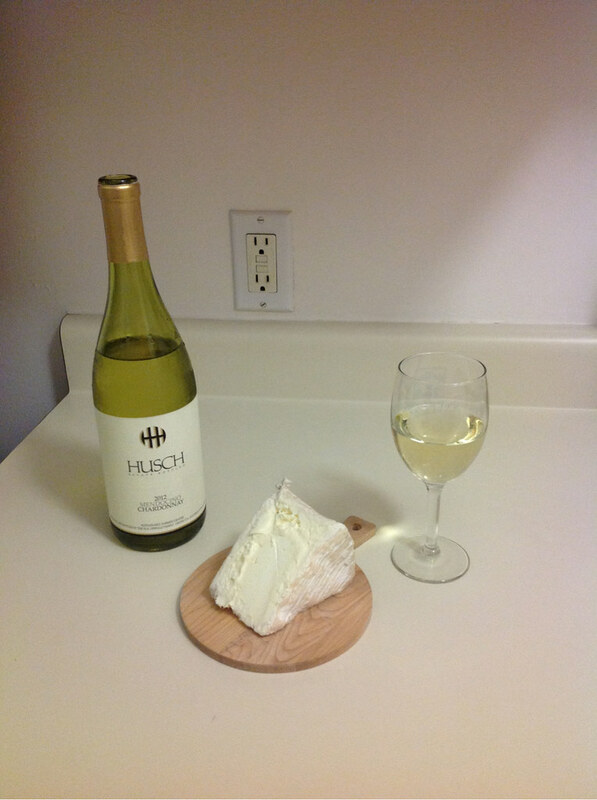 Now onto the true test, the Chardonnay and Le Delice de Bourgogne paired together… The cheese brings out the sweetness in the wine, highlights a more noticeable apple flavor and the wine is much less tart. The wine also caused the cheese to change, the cheese was a little funky and then more sweet, still a hint of saltiness but a noticeable change. Good Pairing! Glad I tried out this suggestion from Trader Joe’s!